The kids have made it back from camp with all body parts still intact…minus a tooth! Last week, we took the kids to Louisiana College for CentriKid Camp 2015. It was an incredible time of fun and faith. This year’s theme was FIT: Faith in Training. We discovered what can happen when we search for God with all our heart (Jeremiah 29:13). Campers discovered more about the spiritual practices that help them grow in their faith. Kids internalized God’s word and allow Him to be their teacher. Each day, the camp provided kids with some practical, take-it-home tools for using spiritual practices as they grow their faith. The daily themes focus around the idea of being a disciple — very simply, a follower of Jesus Christ. I can’t start to tell you how much fun this trip was! From running away from a skunk we never actually saw, to dipping our broccoli in soda before eating it…I know I’ll carry many, many memories of this week with me. I’ll be giving out a report to the church soon, but until then, please enjoy these pictures of our stay at Louisiana College. We did alone time with God near a fountain. Camp pastor, Jerry Wooley, ready for OMC. Lesleigh with her funny face. Waking the boys up wasn’t easy! Mr. Jim meditating on today’s Bible point. The girls enjoyed girl-time with the councilors. The fun continued at night. We always ate our veggies! Pastor Jerry talked about prayer. Camp had an air hockey table. Tossing toilet paper through hoops. Aron, a camp councilor, showing off a new hair do. The boys were worn out! The month of July is filled with many events and activities at FBC Baton Rouge. Much of what we are doing this month is geared toward children and families. We believe in the God ordained blessing of the family, whether it is a single household or a house filled with many children. We love families, and we want to help all of our families grow in faith as we walk together trusting in Jesus. For those of you with children or grandchildren which you have regular contact with, I want to ask you a question: What are you telling them about Jesus? What sort of picture do you paint for them of the kind of Savior and Lord which Jesus has proven to be? I want to be helpful to you in this area, so let me start by saying that this article is meant to be to be challenging and encouraging. I hope this does not come as a total shock to you, but here goes: “Jesus isn’t concerned with doing things your way.” I know that’s a lot to lead off with, but don’t stop reading just yet; give me a chance to show you something magnificent about Jesus. So Jesus does all the things which were spoken of the Messiah (healing diseases, restoring sight, casting out evil spirits), and he does them all in front of John the Baptist’s disciples. Then he tells them to report back to John about all they had witnessed, sending them away by quoting Isaiah 42:6-7 – I will give you as a covenant for the people, a light for the nations, to open the eyes that are blind, to bring out the prisoners from the dungeon, from the prison those who sit in darkness. John knew this scripture, as it was a well-known prophecy of what the expected Messiah would do. John interpreted this prophecy to mean that the Messiah (Jesus) would rescue him from prison (dungeon, darkness). But the prison of Isaiah 42 is NOT intended to be a literal one, but rather a spiritual one. Jesus came to deliver people from the prison of sin. Understandably, John was disappointed, and even “offended” with what appeared to be Jesus’ lack of attention to his circumstances. In his offense he asked if he should be looking for another Messiah. Why was John “offended” by Jesus’ failure to act on his behalf? It is a deep problem that each of us faces from time to time: John the Baptist misunderstood Jesus’ mission. 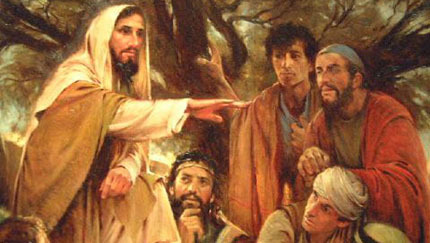 Jesus was not operating based on John’s understanding of the situation. Jesus was not concerned with doing things John’s way because he had higher and greater ways which he was not obligated to reveal to anyone (even someone as faithful as John). In the end, John’s destiny according to God’s will was to prophesy, then suffer, and ultimately die as an example of a life surrendered to God’s will (Read: Matthew 14:5-12). As hard as that may be for us to accept, it is exactly what God expects us to accept by faith, for his glory. Here is the application for our families: our world today is telling our children that they are entitled to whatever they want, and that they can be whoever they want, and they are owed honor, respect, and trust from everyone they meet, and that they have a right to be offended when life doesn’t work out he way they desire. It is a pervasive and destructive worldview, yet is all too real. The greater problem for parents and children who claim to follow Jesus is that we take that perspective and apply it to our relationship with God, as though he owes us some kind of respect and tribute. We often think and act as though we are smarter than God by questioning his motives rather than trusting his plans. Yet God is doing what He has set out to do before the foundations of the world, and he does not need our approval or validation. We are subject to Him; always. We must not take offense to this great and glorious truth. The best thing that we can do for our children is to show them that God’s way is better, and HE is not obligated to fulfill our desires and will, even though we may have the best of intentions with a heart full of faith. Our lives and that of our children’s lives are meant to make Christ known to the world, and for this we must not take offense. Our greatest goal in life is to make sure our children know that Jesus loves them in ways they cannot comprehend and yet Jesus is not concerned with doing things their way. Rather He is carrying out the Father’s will in every way for the glory of God’s name. And for this we must not take offense. Let us serve our children well as we teach them the beautiful truth of God’s sovereignty, that we may not fear what will happen if “our way” is not realized. Rather, let us be faithful to submit to God’s will as a witness to the world that only Jesus’ way is proven right and good. We are not offended by Christ; we are gladly surrendered.